Australia is set make a dramatic about face in its policy towards Fiji, re-engaging with Frank Bainimarama’s regime and assisting it with its plans to return the country to democracy in 2014. After the Grubsheet/Sky News interview with Bainimarama at the weekend – which revealed the extent of Australia’s isolation from its ANZUS partners, Australia and New Zealand, in relation to Fiji – the mood for change in Canberra has hardened on both sides of politics. The Australian reports today that the opposition wants the incoming Labor foreign minister, Bob Carr, to set aside his predecessor, Kevin Rudd’s, hardline stance on Fiji. That policy became known as the “Rudd block” in relations between the two countries. Five years after Bainimarama’s coup, it had demonstrably failed in its aim to force the regime back to the polls but Rudd was too proud and too obstinate to recognise that failure. Only his departure from the foreign affairs portfolio has been able to pave the way for change. And now that he’s gone, events are moving quickly. News Limited newspapers are also reporting today that Bob Carr plans an immediate shift in policy and will discuss the about-face at his forthcoming talks in NZ with its foreign minister, Murray McCully, who’d already broken ranks with Rudd and begun to engage with his opposite number in Fiji, Ratu Inoke Kubuabola. It’s a fair bet that Fiji will do everything it can to make Carr’s job easier. Bainimarama’s strident comments in the Sky/Grubsheet interview have achieved their purpose and the tone of that rhetoric will now be lowered to oil the wheels of diplomacy. All through Saturday, the Fijian leader’s interview had played continuously on a Multiview channel on the one network that every Australian politician turns to for news. While much of the rest of the media – and especially the ABC – chose to ignore the Sky broadcast, today’s story in The Australian confirms its importance in changing attitudes. Whatever the politicians think about Bainimarama, many hadn’t grasped the interview’s central tenet that Australia was now the last man standing in refusing to have anything to do with him. The fact that the United States and New Zealand had broken ranks had made Australia’s position untenable. None of this is news to those whose job it is to ply the corridors of government in the Pacific gauging opinion. For months, American diplomats and the US military hierarchy have been privately expressing concern that the “Rudd block” on Fiji had become counterproductive and was weakening the position of the ANZUS allies where it really counted – in containing China. Abandoning Fiji had driven Frank Bainimarama into the arms of the Chinese. And his comments in the Grubsheet/Sky interview about his personal friendships with the Chinese hierarchy again underlined the folly of Fiji’s traditional friends turning their backs on him. Of all his passions, Bob Carr’s love of the United States is one of the greatest. So it’s to be expected that such a pro-American Australian foreign minister would share Washington’s view that Canberra’s policy on Fiji has long since passed its use-by date. His arrival at DFAT is the clean slate needed to finally change direction. And he’s set to begin that change in dramatic fashion. Thank you Graham for your consistency and unwavering commitment to put Fiji’s case forward to the world. In spite of all the oppositions we face, you have been there all the way advocating on Fiji’s behalf. I believed your efforts has been rewarded. Fiji is proud of you for the dedication you put forward in present Fiji’s point of views to the world convincingly, now Australia has a accepted the failure of the “Rudd Block” policy, and is force to look at Fiji on the premiss of Geo-political change. The NZ media have not bothered to publish any stories today about Bob Carr and his change of direction concerning Fiji – only heard about this through the blogs. Is this selective censorship? The NZ media probably are not happy about this news because since 2006, most NZ media have done everything in their power to paint a bad picture about what is happening in Fiji. 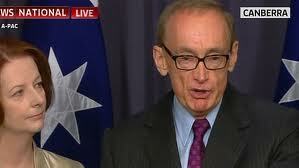 Will be very interesting when Bob Carr reaches our shores. Now is not the time to blink, whince or simply give up Australia. The tide has turned. All of us who were coup supporters have had enough. All previuos coups resulted in short interim administrations. The scenario we have been subjected to (8 years of dictatorship) was never the outcome expected. Australia needs to stay the course and in addition introduce some very seet carrots with corresponding big sticks. If Dictator Frank and his thieving thugs and criminals should try to move the goal posts or shirk from their promises than Fijians will understand your position and remember you loyality to principle.